Recently, music streaming officially surpassed MP3 revenue and streaming is now king. 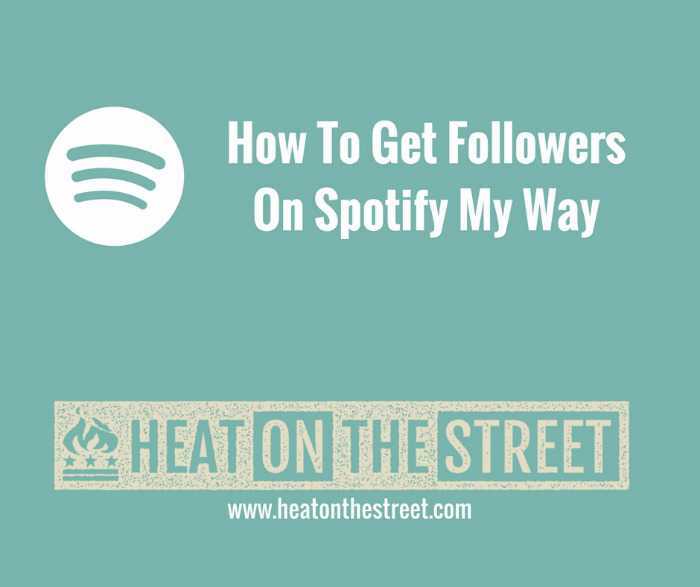 My readers frequently ask me how to get followers on Spotify and how to get on Spotify playlists? What follows is the approach that I use for promoting music on Spotify and my best tips. I’ve been doing music sales for record labels and artists for 15 years, and it has been my responsibility to get placement on Spotify, Apple Music, Amazon, and others. I’ve taken notice of how artists are promoting on Spotify and if you do what is mentioned in this post, you’ll be way ahead of other bands and musicians. What Are The Goals Of Spotify Promotion? It’s important to know specifically what I am trying to achieve when I formulate a plan for artists, tracks, or albums. My overall goal is to get in the Spotify Viral Chart which is open to artists of all sizes. There is the Global Viral 50 chart and each country has their own. Next, I want to always serve the algorithm. 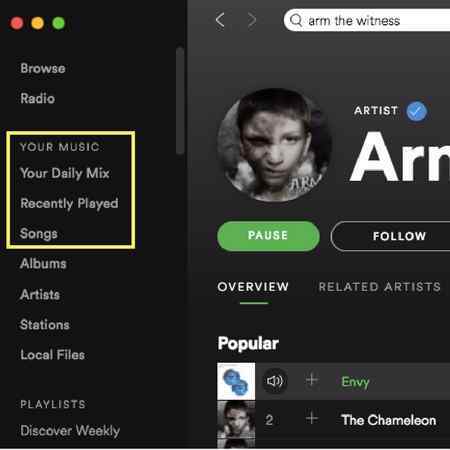 Spotify uses a mix of human curation and a computer generated algorithm to suggest music that users might like. The algorithm is a complex math equation that attempts to guess your interest, tastes, and emotions based on information it knows about a listener. It tracks what you listen to, what you search, like, share, follow, etc. I make no claims to know how this algorithm works, and it is constantly changing. Only the folks at Spotify truly know how it works. Finally, and most importantly, I want to get the music in users collections. Visualize a stack of vinyl records on a shelf. Think of this record collection. I want to get your music into as many virtual collections on Spotify as possible. Because once it’s there, it’s always there. The collection on Spotify is called “Your Music” and it can be found on the left navigation bar (see image below). You want listeners to come back to their collection time and time again. You also want them to follow (or “heart”) you and put a track in a mix/playlist. Most plays are coming from users collections, not Spotify curated playlists. So collections surpass playlists as a goal. Whenever you are doing promotion on Spotify, I recommend you use the desktop or laptop app. You don’t get all the features needed on the mobile app or web-based version of Spotify. Notice the check marks to the left of certain Head North song titles on the image below. I clicked the + mark and added them to my collection. When you click those, it automatically puts it in your “Songs” collection, “Artists” collection, “Recently Played”, and tells the algorithm I want to hear more music from this artist. So on release date, the single for Head North will almost surely show up in my “Your Daily Mix” playlist. It will also show up in my “Discover Weekly” and “Release Radar” playlist which can be found by clicking “Browse” on the left nav and “Discover” on the horizontal nav bar. If you scroll down on the “Discover” section you will see all the other recommendations the algorithm is making for you. This is even more pronounced on the mobile version of Spotify. Most artists and labels put 95% of their focus on getting their tracks on playlists. This is where they fall short. I’ll repeat what I mentioned above. Most streams are coming from users collections and the algorithm. It’s true, a lot of music found in a users collection was discovered in a playlist, but it’s less than half. You want a complete plan that goes beyond the playlist. However I do have tips for getting on Spotify playlists. What Else Do You Suggest We Focus On? Think about how fans use Spotify and engage with music on Spotify. Put yourself in their shoes. Think about their collection, and how you can work your way into it. Getting in somebody’s personal collection for life is the ultimate goal. All the work you do now, will pay off for years to come, not just a quick blitz. Simply ask fans to add your music to their collection by hitting the “+” mark next to the track or dragging it into one of their playlists. This works best on a Facebook Live chat, or with street teams. Ask fans to hit the “Follow” or “Heart” button below your band name on your profile page. Desktop app users “Heart” and mobile users “Follow” (this featured changed in June 2018). Have your fans “Share” your music from Spotify on social media by using the “… more” button that appears when you roll over a track. I have to believe this really factors into the algorithm for the Viral charts. Use contests and incentives to get more participation. Spotify Has Put Everything Out There For You Already. Take advice directly from the source. Spotify have gone into great detail on how artists can and should utilize the service. It’s totally worth spending several hours searching around the Spotify website artist section. https://artists.spotify.com Get access to your stats through Spotify For Artists. Check out their Guide, FAQs, and best practices. Spotify has done much more than other large music services to educate and build a relationship with artists. Think about that. These are real people with a passion for music. Get to know them, and build a relationship with them. Your Spotify business is only as good as your relationship with them. OK, So How Do We Get Followers On Spotify and Increase Our Streams? Spotify is heavily focused on tracks, not albums. 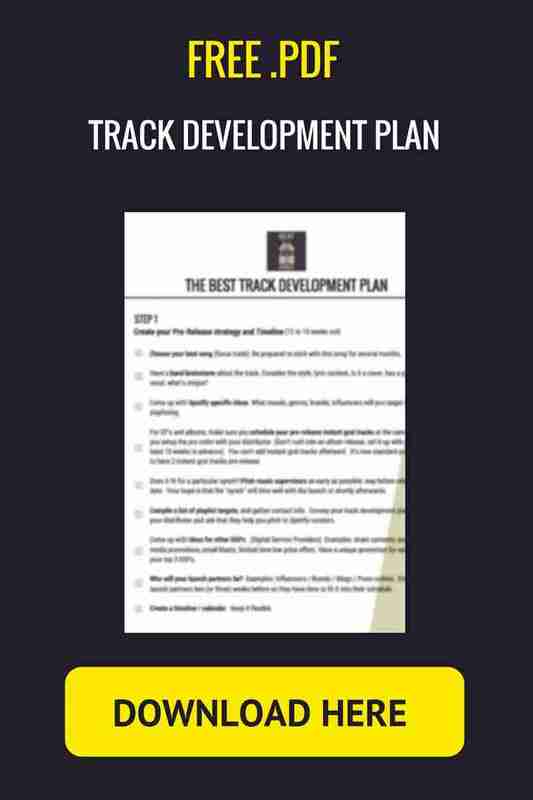 Most artists have an album marketing plan, but a track development plan is equally essential. Once a track is in a users collection, the algorithm will recognize it and serve more tracks from the artist. So build an entire plan around your track. That includes advertising. Sounds crazy right? It’s not. A large portion of my advertising dollars have been pointed at track streams and track downloads. I still recommend advertising albums and album pre-orders, but increasingly the emphasis is on the focus track. Buy Facebook advertising to boost your Spotify track streams. There is much more to it than advertising. With this in mind, I created a PDF with the Track Development Plan that I personally developed and use. Click Here to get your free download. The statistic listed in the top right of your artist page “Monthly Listeners” is a metric that measures your popularity over a rolling 28 days. The number changes every day based on the last 28 day period, and the listeners don’t accumulate. If you have Spotify For Artists, you can also see your daily and weekly listeners, but the public can’t. Industry A&R look at your monthly listeners and plays. I’ll clarify listeners versus plays. Listeners are different people listening to your tracks, and plays are how many times your tracks are actually played and they accumulate. Play accumulate, listeners do not. I recommend you track your monthly listeners like you track social media followers, track sales, and total streams. Traffic and engagement is a great way to positively affect the algorithm. Think about traffic as anybody searching for something and being directed over to Spotify. Most fans use the search engines below to learn more about your band. Make sure to have an easy to find link to Spotify in all of these places when a potential fan encounters them. Since playlists are at least half the plan, make sure to use the right approach. 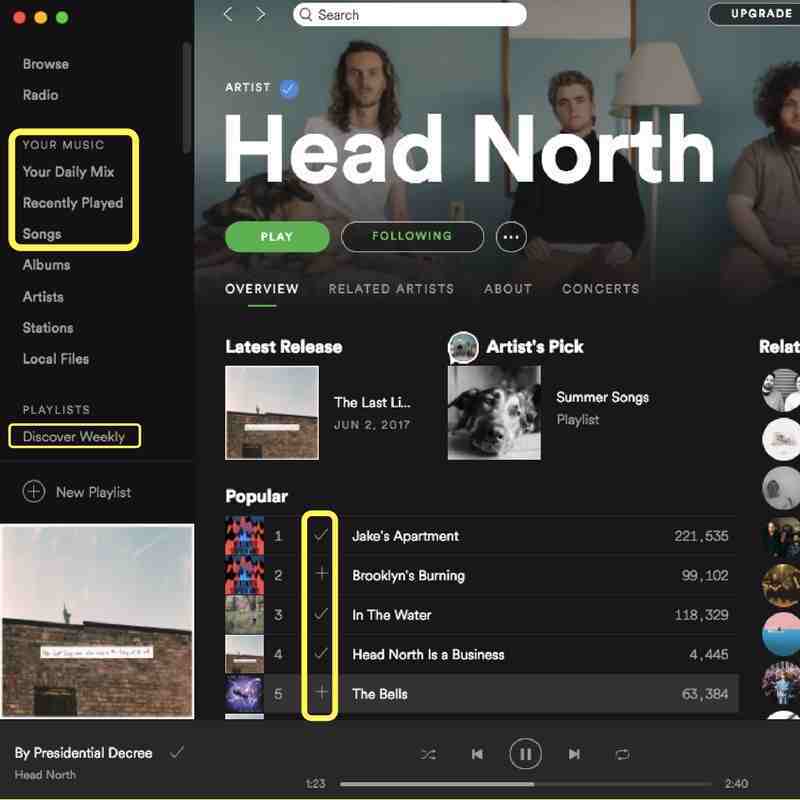 The Spotify editorial team is 100% responsible for determining which music is playlisted on their official playlists and algorithm based playlists (Discover Weekly, Release Radar, etc.). User playlists can be created by your band or you can contact the creator of a user playlist and pitch your song for inclusion. It’s up to you to utilize Spotify like a search engine and discover which user playlists best fit your music and have enough followers to justify your time tracking them down. If you reach out to Spotify or another playlist curator keep it simple. “Hello, thanks for taking a few minutes to check out our track”. Don’t be long winded. Keep it less than 200 words. Call attention to the moods and genres of the song, and a couple big talking points for you band (your biggest achievements to date). In case you haven’t heard yet, you can submit your music for official Spotify playlists direct. Spotify launched a beta of their Song Pitching Tool where artists, artist managers, and labels can now submit one“unreleased” track to Spotify directly through the Spotify For Artists portal. Here is the official release from Spotify. If a curator reaches out to you and asks for more information, than you can talk up your band all you want because now they’re interested. Unless they give you options, don’t suggest which specific playlist you want your music on. Understand that the curators do this for a living and they pride themselves on being knowledgeable about music genres. By telling them where you think it should be placed can come off as an insult. They know what to do with your track. Where Else Can I Playlist My Tracks? Use Facebook Live to ask all your fans to add your music to their collection real time. While you’re at it you could ask them to “Follow” or “Heart” your profile, and then “Share” your focus track on social media. Social media will be your best bet for affecting the viral algorithm. And that algorithm is what get’s Spotify curators attention, and potentially unlock the coveted Spotify curated playlists with hundreds of thousands of listeners. Come up with other creative ways to promote through social media. If you don’t have a playlist on your artist page already, make one now. Create a few artist playlists (learn how here). However, my tip is to focus on one playlist and push that playlist through social media. You can always rename and re-theme the playlist and keep your followers. Each time you have a new track you can work it into your playlist, and your followers will get a notification when you update it. I challenge you to come up with your own creative ways to playlist music. Some influencers and media outlets use Spotify as their main playlisting tool. So seek those out, and make them aware of your music for consideration in their playlist. When an artist is being featured in a magazine or blog, I’ll ask if they want the artist to create a Spotify playlist that accompanies a press feature. Include a couple of your tracks amongst the others in the playlist you create. Don’t make them all your tracks. That’s right, Spotify has been around for over 10 years. They launched April 23rd, 2006. It’s become a powerful search engine for discovering and interacting with music. Here are some things I’ve learned so far. Spotify isn’t something your band or label should dabble in occasionally. The algorithm rewards frequency of use, engagement, and refreshing the content in playlists and collections. You can’t get lazy and take a week off or a month off. I’ve been lost in the work week and forgot to update a playlist, or add new music to my collection. Discipline yourself and schedule it into your workload. Don’t mistake “frequency” for release a track every week, or even every month. Be strategic about your track releases. It feels great after putting time into pitching tracks for playlists, or working hard at my track development plan. But it’s frustrating when no playlists materialize, engagement is low, and it can feel like all your work went unnoticed. You have to remember that an algorithm is in play, and it doesn’t work instantly. The algorithm takes several weeks to collect and gather data and to form conclusions about a track. Unless you are calling out from stage for your fans to take action, you can’t get them all to interact right away. It takes time for word to spread and people to catch on. Stay on it daily and weekly until you feel you’ve exhausted all possibilities for a track to catch on. I find myself wanting to judge a track or draw conclusions in the first couple weeks. Often times a track can take on a life of it’s own, usually from uncontrolled sources. An influencer or fan will talk about the track passionately in some corner of the internet. I’ve witnessed an artist work hard for 18 months, give up, go back to working jobs, only to have their tracks catch fire on Spotify after 3 years. The key is sticking with it, even if it’s going slow. I hope that you’ve learned a few things that you didn’t already know. Spotify is drastically different from transactional sales accounts, and it can’t be viewed through the lens of an iTunes, Amazon, brick and mortar retailer, or YouTube. The platform is constantly changing and you need to keep up with it. Try new things. Team up with your band mates and focus on a track development plan. We need to constantly visualize listeners discovering and putting music in their record collections. Leave comments with your feedback. And please do me a little favor and share this post with others, for there’s a good chance that it will help them with their band. As someone who has recently released music on Spotify, I learned a lot from this article. I appreciate you sharing your expertise and I’ll share with others who are looking to establish their presence on the platform. The one thing that I’d love to have more insight on is how to professionally reach out to playlist curators. You provided some great advice in the article, but it seems like a nuanced activity with quite a few considerations. I’ve been successful a number of times requesting to be added, but in other cases, I feel like I’m spamming. Thanks for the comment Ian. I’m sure others are wondering the same thing. This article was published in July 2017. I am working on a follow up with fresh new insights for Heat On The Street readers. I will include more detailed advice there. For now, don’t worry about spamming. If you don’t ask, you’ll never get. Keep it short. Let them know you enjoy and subscribe to their playlist, please consider your song with a URL link. Make sure your track is a great fit, and call out other artists they have playlisted that sound similar to you. Thank them for their consideration, and that’s it. short and sweet. Let them know “P.S. if added we’re happy to share with our XXXX amount of social media followers”. Very good article. I learned a lot and look forward to using this advice and plans in promoting my artists. Monthly listeners is on a rolling 28 day basis. So you lost 300 listeners on that 29th day that fell off. The number changes every day based on the last 28 day period, and the listeners don’t accumulate. Plays accumulate, but monthly listeners do not. Hope that helps. Very useful information. Hopefully getting curators to listen to your music will be way easier in the future. I guess anything could flourish with patience and persistence, and that’s what we have to stick to right now. Thanks! This is a great article,thank you. My question is – how do you figure out who the curators are in order to email them? I see ‘curated by’, but how would I find their individual email address or contact info? It’s tedious and time consuming to track the curators down, but you just have to put the work in. Some tips: Many of them put a submission form right in the description of the playlist. Some put email addresses in there too. Look at their username on Spotify, then search that same name on Facebook and Twitter. Reach out that way. Google their name or search it on other sites (FB, TW, IG, LinkedIn). With enough digging you can track people down. When you reach out, be respectful, keep it short, and make sure to actually listen and subscribe to their playlist. Make it a genuine effort and if they support you, back them up with social media posts to help spread awareness of their playlist. Thanks for this article. Spotify has always been a mystery to me; mostly because I’m busy making the music. I’m putting your suggestions to work and now have set aside daily listening and creative maintenance. Thanks again. I enjoyed your article and did learn a few things I didn’t already know, especially about how saves work. Thank you! In your experience, have you seen noticeable differences in the compounding effect of consecutive releases with respect to the algorithms? For instance, releasing a 4-song EP once every 4 months vs. 4 singles per month for 4 months vs. 4 weekly singles for 4 weeks, etc? On one hand, I’m sure the data accumulated over a longer timeframe would have its advantages, but I wonder what the sweet spot might be. Here’s (hopefully) a better way to clarify what I’m asking: Say an artist wanted to release 12 new tracks (all good stuff, no filler). In your experience, have you noticed any difference in how the examples below might affect the algorithms differently, in particular for Discover Weekly / Release Radar playlists? I’ve made some observations of the trends for my own releases, but my stats are very limited so far. Hi Stephen, To answer your question I want to point you to another article I wrote called “Singles Vs Albums” http://www.heatonthestreet.com/singles-vs-albums/. It will answer your questions. Furthermore, I never recommend releasing 1 song per/week. You’ll never get the benefit of the algorithm. It takes weeks for algorithms to fully complete their cycle. I don’t recommend a single a month either. It’s just not a long enough time. I believe in track development plans and having advertising, contests, video, synch, some form of radio, and PR behind each track. Also focusing on a track for at least 2 or 3 months. I’ve seen no examples of success with short term campaigns. Nor do I think it’s the way most consumers want to experience music. Thanks Todd, I appreciate your insight. I read the other article as well. My current situation is a bit unique, my music is singer-songwriter genre and I’m in the process of re-releasing my back catalog (7 albums + 2 EP’s) and rather than just dump it all in there at one time and say “here’s all the old stuff” I elected to release 1 project per month until I get caught up on the old, so I can then move forward with the new. In this process I’m just trying to gain a better understanding of how the algorithms work, if nothing else to help me strategize new releases in the future. Also I’m a nobody indie artist with little funds for advertising, radio (ha!) and PR for each album or track right now, so it’s all pretty much in the can for the time being. Your track development plan looks good though, I’m just having trouble seeing my music fit into that outline. This was a surprise for me because in my experience and stats exactly the opposite happens. And these figures are consistent since 2016. So what is happening? The amount of strems from “other listener’s playlists” It is ten times larger than “their own playlists and library”. Don’t get me wrong. I am not negatively critisizing your statement. I am only wondering … am I perhaps missing something fundamental in my current strategy? Tangentially, I wonder what is “other”. SInce this is 11%, it would be important (vital) to find out with more detail. Maybe embedded widgets here and there? Where, concretely, is “here and there”? Some idea? Thanks for your comment – I think it may help other readers, and further illustrate my point. Most streams on Spotify are coming from “user collections”. That could be songs they favorited, saved, or put into a playlist (in their collection). In your case 80% of streams are NOT coming from Spotify editorial playlists or Spotify algorithm based “personalized” playlists. 76% of your plays are from users (6 % – Their Own Playlists & Library, and 70% Other Listener’s (users) Playlists). So you’re not missing anything, and are not different from most artists. One thing I’ll add is that it’s important to have a “balanced” approach. Don’t lean your strategy too heavy on Spotify. Spotify doesn’t want to be “alone” on promoting an artist. If media is talking about it, or Spotify are getting traffic from social media, Wikipedia, or Google search (or Spotify’s own search bar), that proves an artist has outside drivers.